Copyright © 2013 Joseph Mangano et al. This is an open access article distributed under the Creative Commons Attribution License, which permits unrestricted use, distribution, and reproduction in any medium, provided the original work is properly cited. Risk of developing congenital hypothyroidism (CH) has been linked to fetal exposure in several populations. The earliest elevated CH rates were documented after exposures to high doses of radioiodine. These populations include residents of the Marshall Islands exposed to 1954 hydrogen bomb tests [1,2] as well as subsequent nuclear tests [3-6]. Similar risk of disease was found in Gomel, Belarus, proximate to the 1986 meltdown of the Chernobyl nuclear reactor . A twofold CH increase was documented downwind of the Three Mile Island nuclear plant in births during the nine months after the partial meltdown in 1979, while no change occurred upwind [8,9]. The heightened sensitivity of the fetus to radioactivity , the documented risk to human health after relatively low-dose exposure, and the known biochemical hazards of thyroid-seeking radioiodine isotopes jointly increase risk of CH in newborns exposed to radioactive iodine. In northwest US states, CH rates rose most sharply after Chernobyl, after sustaining the heaviest fallout in the nation, including I-131 detected in milk . The main path of exposure to short-lived isotopes such as I-131 has long been acknowledged to be via dairy products due to radioactive fallout deposition on forage. The current CH rate in the four counties closest to the Indian Point (NY) power plant is approximately twice that of the US . In a recent report, two of us (JM and JS) documented that the greatest concentrations of I-131 in US precipitation following the 2011 meltdown at the Fukushima nuclear plant occurred in the three Pacific coast states of California, Oregon, and Washington, along with Alaska and Hawaii . Levels were much lower than those observed in Japan, but well above previous levels. The report showed that in the nine months following the arrival of Japanese fallout in the US, CH rates in the five states increased significantly (RR = 1.16, p < 0.03). The greatest increase occurred in the first three months after the meltdown (RR = 1.28, p < 0.04). There was no significant change in the other US states, which received lower doses of radioactivity. Analysis of CH rates in the US is hampered somewhat because each of the 50 state newborn screening programs is operated independently, and each defines CH using its own criteria. Some states only measure thyrotropin, or Thyroid Stimulating Hormone (TSH) in the baby’s blood, while others measure thyroxine (T4) in addition to TSH. In addition, states assign different thresholds to define confirmed cases of hypothyroidism; thus, meaningful interstate analysis of rates is difficult. Another shortcoming of analyzing CH rates is that the disorder is relatively rare. About 2000 US cases are confirmed annually out of about 4,000,000 live births, a ratio of 1:2000 . This low number of cases makes it difficult to analyze any patterns within small geographic areas or short time periods. The definition of CH excludes “borderline” cases, that is, those whose thyroid hormone levels are abnormal but are not confirmed as CH for therapeutic purposes. This report will compare CH rates—using a combination of confirmed and borderline cases—with changes in environmental radioactivity from Fukushima, within a single US state with a consistent definition of the disorder. This approach will allow a much larger number of cases to be used, making it more likely to obtain significant results. One of the five US states that received the greatest amount of environmental radioactive fallout from the Fukushima nuclear disaster is California, with an estimated 2012 census of 38,041,430 . Slightly more than 500,000 births occur each year to California residents, representing about 1 in 8 US births . The state of California operates a newborn screening program that analyzes blood from each newborn for multiple congenital disorders. The program confirms CH cases by using only TSH scores greater than 29.0 micro international units per milliliter (μIU/ml). Any child meeting this criterion is prescribed replacement thyroid hormone, to promote normal physical and mental development. On January 1, 2011, the state changed the assay method used to calculate TSH. Scores increased in most newborns, and thus the number of CH cases also increased . The California newborn screening program provided the number of newborns by TSH score (all in MIU/ml) for each year from 2009 to 2012 (Table 1). The number of newborns is given by single units of TSH (0.0 to 0.9, 1.0 to 1.9, up to 29.0 and over). Table 1. Number of newborns tested for thyroid stimulating hormone California, each year 2009-2012, by birth cohort. 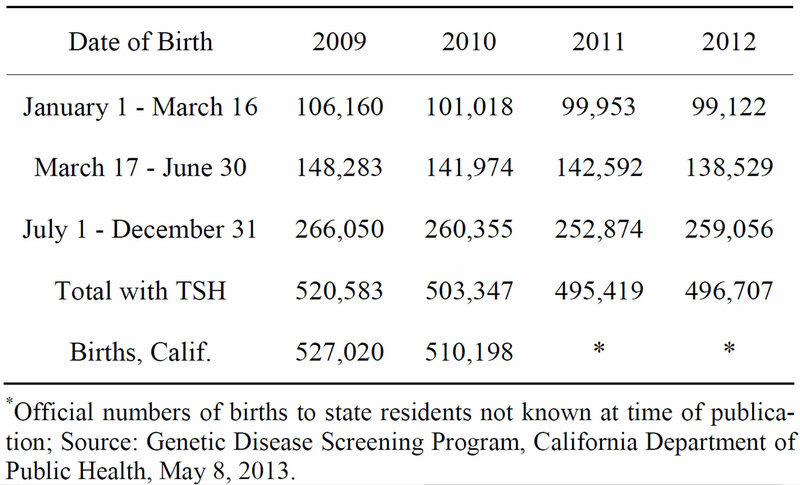 *Official numbers of births to state residents not known at time of publication; Source: Genetic Disease Screening Program, California Department of Public Health, May 8, 2013.
less than the 29.0 required for confirmation as CH are of interest, even though they are not prescribed replacement thyroid hormone. The number of these “borderline” CH cases will likely be much greater than confirmed cases. Defining a universal threshold for borderline CH is not possible, because screening programs differ in the type of assay programs used, and thus TSH scores may vary by program. One recent study defined “mild” CH cases as those from 20 to 100 μIU/ml,  while another concluded that a number of CH cases have less than 10 μIU/ml of TSH . In defining a threshold TSH level for borderline CH cases in California, we select a cautious range of 19.0 - 28.9 μIU/ml, or about 0.5% of all California newborns in 2011-2012. Adding the borderline cases increases the 2011-2012 CH total to 4670 (658 confirmed, 4012 borderline), more than a seven-fold rise. It is unfortunate that there were limited and sporadic testing of Iodine-131 levels in milk, water and foodstuffs in California. It was therefore necessary to analyze the extent to which California, located on the Pacific coast, received greater amounts of fallout from the Fukushima meltdown than did the non-western portion of the US, from official government measurements of gross beta concentrations, detected through air filters, because of the large number of measurements for this type of radioactivity . Table 2 presents beta patterns for six  sites throughout California, compared to 22 US sites, each in a different state, none located in the western portion of the US, and all east of 112 degrees west longitude. Only sites with 1 - 2 measurements weekly through the first six months of each year were included. The period March 18 to April 17, 2011 revealed elevated levels of gross beta in US air, compared to normal values. 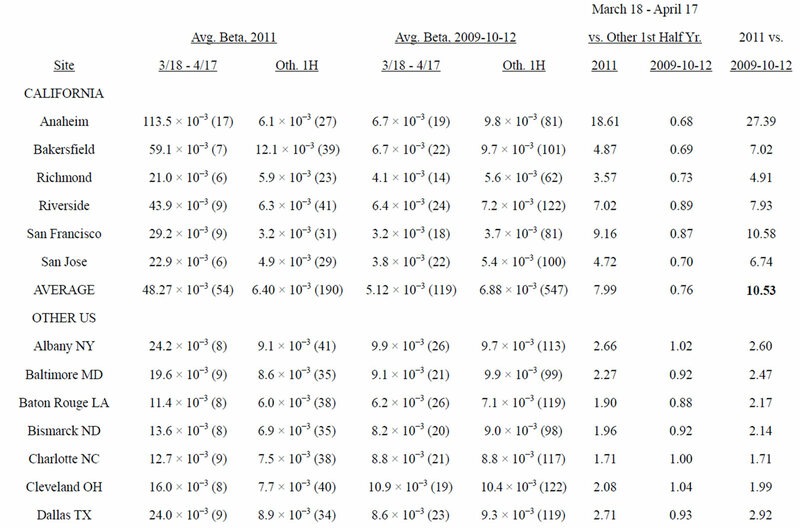 We calculated ratios of gross beta for March 18 - April 17 compared to rest of the first six months of the year, and compared 2011 ratios to those of 2009-2010-2012. Appendix 1 includes results for each site. Table 2. Ratios, March 18 - April 17 vs. other first six months of the year, gross beta concentrations in air filter samples, 2011 vs. 2009-2010-2012 Combined, in picocuries per Cubic meter, six California sites and 22 Non-Western US sites. 2011 was 7.99. In the other three years, the ratio was 0.76, as airborne beta concentrations during the winter months are typically greater than in the spring. Thus, California beta was 10.53 times greater than expected during the period March 18 -April 17, 2011 (7.99/0.76). For the other 22 US sites the 2011 average gross beta in the month after Fukushima was 2.34 times greater than the rest of the first half year, compared to 0.92 for 2009, 2010, and 2012. Thus, average beta was 2.55 times greater than expected (2.34/0.92), far less than the 10.53 figure for California sites. Appendix 1 shows some variation in gross beta averages between California sites, but consistently higher concentrations in that state. The highest readings occurred at the station in Anaheim CA, a suburb of Los Angeles; 7 of the 17 measurements in the month after Fukushima were over 172.0−3 picocuries per cubic meter, compared to an average reading of 6.7−3 for that period in non-Fukushima years. The single high measurement in California was 276.0−3 on March 19, 2011. Fukushima fallout levels were greater in California than in most of the U.S., raising the question of whether health of humans, especially the fetus, was affected adversely. 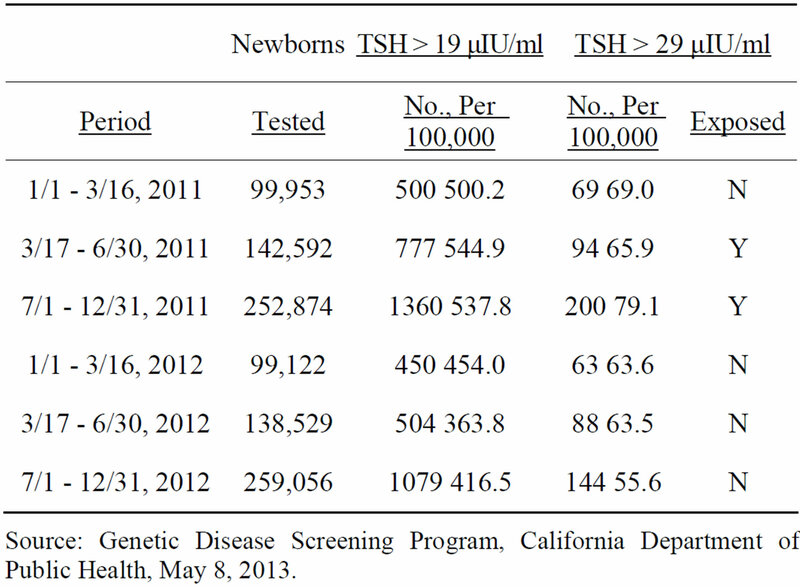 The 2011-2012 change in the proportion of California births with a TSH score greater than 19.0 μIU/ml will be analyzed. Because births in the last 9.5 months of 2011 were exposed in utero to the elevated levels of radioactivity from Japan, we expect an elevated 2011-2012 reduction in the proportion of elevated TSH scores to occur in the births from March 17 - December 31. The cohort of persons born January 1 - March 16 was not affected in utero by Fukushima in 2011 or 2012. Table 3. Confirmed and borderline congenital hypothyroid incidence, by period of birth, California newborns, 2011 and 2012. Source: Genetic Disease Screening Program, California Department of Public Health, May 8, 2013.
comparison with prior years is possible. In order to produce an analysis of newborns most affected by Fukushima fallout, the years 2011 and 2012 were divided into the periods January 1 to March 16, March 17 to June 30, and July 1 to December 31. Table 3 includes the number of births in each of these periods by year and numbers and rates per 100,000 tested for newborns with TSH scores over 19 and over 29 μIU/ml. There was fairly complete coverage of newborns. Births with a known TSH score reported by the state program for 2009 and 2010 equaled 98.7% of the total births to California residents (final 2011 and 2012 birth totals are not yet known). We carried out statistical tests on the basis of periods which we defined as “exposed” (newborns born in the 9.5 months after Fukushima fallout arrived in the US) and “unexposed” (all other 2011 and 2012 newborns) in Table 3. Results of the statistical significance test, using a Mantel Haenszel chi-square test are given in Table 4. Table 4. Statistical significance tests, California newborns, confirmed congenital hypothyroid cases (TSH > 29 μIU/ml), and confirmed plus borderline congenital hypothyroid cases (TSH > 19 μIU/ml), newborns March 17 - December 31, 2011 vs. rest of 2011 and 2012, using mantel Haenszel chi-square test. RR = 1.21, CI (1.04 < RR < 1.42), χ2 = 6.15, p < 0.013.
confirmed cases resulted in a much higher level of statistical significance (p < 0.00000001). Unexpectedly large 2011-2012 declines in borderline plus confirmed rates occurred in the newborn cohorts involving those exposed to Fukushima fallout in utero. The March 17 - June 30 decline was −33.2% (544.9 to 363.8 cases per 100,000 births), while the July 1 - December 31 decline was −22.6% (537.8 to 416.5 cases per 100,000 births). With much larger samples than just confirmed cases, a better understanding of the true change can be approached. The presence of elevated concentrations of environmental radioactivity after the Fukushima nuclear meltdown in west coast and Pacific US states raises the question of whether exposure to this radioactivity harmed humans, especially the vulnerable fetus. We have already documented increased rates of newborns with a confirmed diagnosis of Congenital Hypothyroidism (CH) in this region during the nine months after the arrival of fallout. Each of these births was exposed to elevated radioactivity levels in utero. Defining a clinical threshold for disease diagnosis is important, particularly as a marker to initiate treatment. So too are identifying “borderline” cases, whether it be used for individual patient treatment, population based health delivery, or as a means of understanding causality. Commonly employed tests, such as those for body mass index, cholesterol levels, blood pressure, and various immune system functions, are examples of the importance of both diagnosed and borderline cases. Fetal exposure to radioiodine may raise risk of not just confirmed, but borderline CH, despite having to define borderline cases arbitrarily. In California, adding borderline cases (TSH between 19.0 and 28.9 μIU/ml) to those confirmed cases (TSH over 29.0) increases the number of cases by more than seven fold. Elevated levels of environmental radioactivity in the US reverted to typical concentrations after just several weeks in spring 2011. Moreover, most radioiodine from nuclear reactors consists of short-lived isotopes, most commonly I-131, with a half-life of just 8.05 days, suggesting that U.S. exposures to radioiodine from Fukushima occurred only in the spring of 2011. The significantly elevated levels of CH in California during the 9.5 months after fallout from the Japanese meltdown arrived was observed for both confirmed cases and the total of confirmed plus borderline cases. While both elevated rates were statistically significant, the confirmed plus borderline group was highly elevated as many more cases (4670) were included in 2011-2012, as opposed to just 658 confirmed cases. The findings support research that the fetal thyroid gland is particularly vulnerable to adverse health effects from radiation exposure. The fetal thyroid, the first glandular structure to appear in the human embryo  begins to concentrate iodine and produce thyroid hormones by the 70th day of gestation. Proper brain development is dependent upon adequate thyroid function . This report addressed doses to California fetuses from the meltdown at the Fukushima nuclear plant. 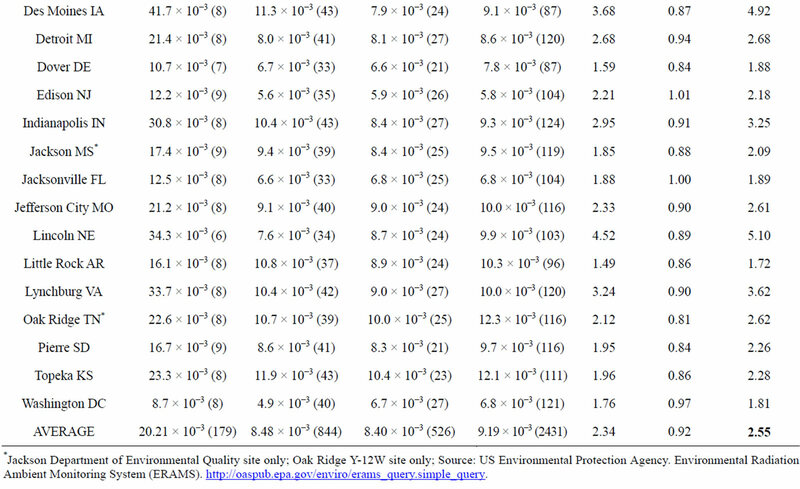 While official US government data includes a limited number of measurements of radioactive iodine concentrations in air, water, or other environmental media, most of the highest levels were found in the western US. Our use of gross beta concentrations in air is less specific, as gross beta includes multiple beta-emitting radioactive chemicals, not just iodine, but also Cesium-137 and other radioisotopes. Our finding that the actual vs. expected ratio in California airborne beta in the month after Fukushima fallout arrived were over four times greater than in non-western sites (10.53 vs. 2.55 times above the expected) supports the understanding that the western and Pacific US received the greatest exposures, raising risk of subsequent adverse health effects. Measuring deciduous teeth for concentrations of Strontium-90, taken up late in pregnancy and after birth, is used to measure exposure. Studies of Sr-90 from atom bomb test fallout, the Chernobyl meltdown, and near reactors in the US and UK have provided valuable data on actual doses to humans [22-28]. More studies on potential adverse health effects to the thyroid gland, in areas proximate to and far from the Fukushima plant, are urgently needed. Japan’s Fukushima Medical College is tracking local children under age 18. The project has already documented the presence of a thyroid nodule or cyst in 43.6% of 94,426 of these children . It has also diagnosed 44 thyroid cancer cases since March 2011 out of 178,000 children 0 - 18 tested an annual rate of over 12 cases per 100,000 persons vs. an expected annual rate based on the analysis of the Japan Cancer Surveillance Group of 0.15 per 100,000 in 2005 . This is a remarkably high Standardised Incidence Ratio of 80. More suspected child cancers have not yet been confirmed . Studies should not be limited to the Fukushima area because doses in distant locations may be lower. Fallout from the meltdown crossed the Pacific Ocean and reached the US west coast in five  days, eventually circling the entire northern hemisphere. Thus, many were exposed to relatively low doses of Fukushima radioactivity—which nonetheless pose a risk to human health. In its last two reports on the topic, the Committee on Biological Effects of Ionizing Radiation (BEIR) concluded a linear no-threshold dose response exists between radiation and health risk, and upheld the heightened sensitiveity of the fetus and infant [32,33]. 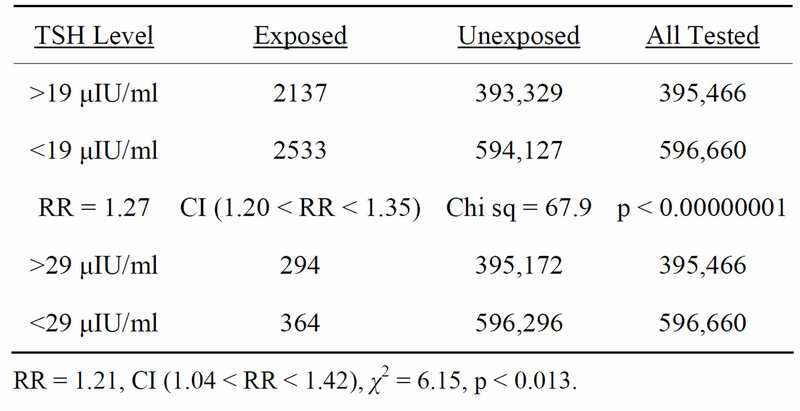 Stewart and others demonstrated a near-doubling of childhood cancer mortality risk after exposure to in utero pelvic X-rays during pregnancy [34-36]. The US Institute of Medicine and National Research Council estimated as many as 212,000 Americans developed thyroid cancer after fetal/infant/ childhood exposure to relatively low-dose radioactive I-131 from atmospheric nuclear weapons tests over the Nevada desert [37,38]. Although less than three years have elapsed since the meltdown, health effects of low-dose exposures from fallout should be analyzed, especially for those in the earliest stages of life. Health status measures after March 2011 such as infant deaths, neonatal deaths, birth defects, stillbirths, low-weight births, premature births, and cancers in the first year of life can be analyzed. Short-term findings of the young can serve as a warning about potential long-term adverse health effects on populations of all ages. Cronkite, E.P., Bond, V.P. and Conard, R.A. (1995) Medical effects of exposure of human beings to fallout radiation from a thermonuclear explosion. Stem Cells, 13, 49-57. McLeod, G.K. (1981) Some public health lessons from Three Mile Island: A case study in chaos. Ambio, 1, 18-23. California Department of Public Health (2013) Genetic disease screening program. Levitssky, L.L. and Straussman, S. (2012) Congenital hypothyroidism—Monitoring thyroid function in infants. European Endocrinology, 8, 53-56. Langham, S., Hindmarsh, P., Krywawych, S. and Peters, C. (2013) Screening for congenital hypothyroidism: Comparison of borderline screening cut-off points and the effect on the number of children treated with levothyroxine. European Thyroid Journal, 2, 180-186. Arey, L.B. (1954) Developmental anatomy. W. B. Saunders, Philadelphia, 237-238. Rosenthal, H.L. (1969) Accumulation of environmental strontium-90 in teeth of children. Proceedings of the Ninth Annual Hanford Biology Symposium at Richland Washington, Washington DC, 5-8 May 1969, US Atomic Energy Commission. Committee on the Biological Effects of Ionizing Radiation, National Research Council (1990) Health effects of exposure to low levels of ionizing radiation (BEIR V). National Academy Press, Washington DC. Committee on the Biological Effects of Radiation, National Research Council of the National Archives (2005) Health risks from exposure to low levels of ionizing radiation (BEIR VII). The National Academies Press, Washington DC. MacMahon, B. (1962) Prenatal x-ray exposure and childhood cancer. Journal of the National Cancer Institute, 28, 1173-1192. Appendix 1 . Ratios, March 18 - April 17 vs. other first half year, gross beta concentrations in air filter samples, 2011 vs. 2009-2010-2012 combined, in picocuries per cubic meter, six California sites vs. 22 Non-Western US sites. *Jackson Department of Environmental Quality site only; Oak Ridge Y-12W site only; Source: US Environmental Protection Agency. Environmental Radiation Ambient Monitoring System (ERAMS). http://oaspub.epa.gov/enviro/erams_query.simple_query .